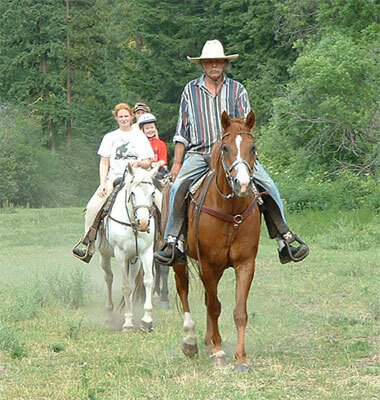 Join us this season on a beautiful horse, led by a friendly guide, along the refreshing trails of the Eagle Creek area Wenatchee National Forest. We're glad to teach the basics of handling our gentle horses to beginners. The youngest riders (ages 6, 7 and often 8) will also have a lead rope kept on their horse for the smoothest experience. For safety, all riders must be able to speak English well enough to communicate with their guide. For a description of rider weight limits please see the FAQ page. Thank-you for your understanding! April only, nearly 4 mile loop up the valley and back. About an hour and 20 minutes, $36.97 per person. Our most level ride, 40 minutes along a pretty wooded trail, for ages 6 and up. $27.73 each. Approximately 1 hour, good for all ages (6 and up); no experience necessary. Enjoy the beautiful Eagle Creek valley, or, when conditions are suitable, we’ll climb the ridge to a viewpoint. $36.97 per person. This longest option combines the first two trails! An hour and 40 minutes, $50.83 per person. For young children ages 4 to 8, who would like to spend a few minutes visiting a kids' horse, plus ride horseback while being led on a 8 minute route around the ranch yard, $13.86 each. 8.2% Sales tax will round all prices up to an even dollar.